Does your dog suffer from osteoarthritis, arthritis, lameness, pain, and inflammation as a result of acute and chronic musculoskeletal disorders like disco-spondylosis, arthropathy and soft tissue injuries? Your best choice for your dog's care is Metacam, a non-steroidal anti-inflammatory drug (NSAID) that is great for dogs that have shown allergies to NSAID based medications. The most common side effects of Metacam are vomiting, soft stools, diarrhea, and lack of appetite. Dogs that are dehydrated or have preexisting renal, cardiovascular, or hepatic problems may be at risk for renal toxicity as a side effect. 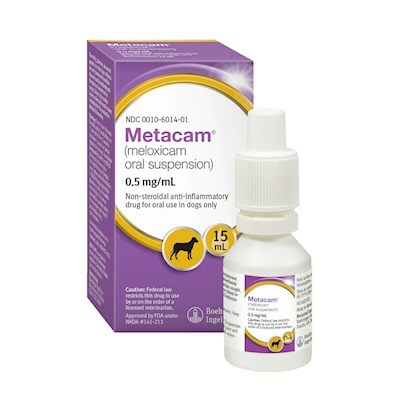 Metacam is for use in dogs of at least 6 months of age. It is to be administered once daily; dosage is adjusted according to the weight of the dog, as indicated on the accompanying syringe. Shake before use; then, after measuring the medicine into the syringe, push the plunger to empty it into the dog’s food or mouth (immediately before or after feeding).